Despite the regime's best efforts, ideological challenges are still permeating in Iranian society. Our expert is referring to Ayatollah Ruhollah Khomeini’s innovative governing philosophy known in Arabic as waliyat’i faqih (velayat’i faqih for Persian speakers). The central tenet entrusts power to the most qualified, living Islamic legal authority of the times to act as a supreme guide for all Muslims. Khomeini envisioned the position as extending its authority throughout the Muslim world, though was pragmatic in practice and had a goal in his lifetime to lay the groundwork for greater Shiite influence by getting more Sunnis to accept the dominant Jafari branch of Shiite Islam as another legitimate school of Islamic thought parallel with the four main Sunni schools: Hanbali, Hanafi, Maliki and Shafi’i. A major contrast between that Jafari School and the major Sunni ones is that Jafari jurisprudence is more dynamic. Broadly speaking, Shiite scholars tend to permit what is known as ijtihad, or jurisprudent reasoning, in a way that allows for interpretation of law on new, time-relevant issues. Contemporary Sunnis rely more often on existing precedent. When asked by Arutz Sheva if “pro-revolutionary” Iranians who support the religious government structure are advocating major reforms to it, our contact intimates that it is hard to distinguish ‘reformers’ from people who are bent on ultimately changing the structure of government. Discourse is, however, dynamic. The late 1990s and early 2000s are considered a period when Iran was most open to reforms, with the election of Mohammed Khatami to the presidency in 1997. The period is also considered a failure though, as resistance to change stymied any promises or efforts Khatami and his allies might have made. Eventually, Mahmoud Ahmadinejad took office in 2005 and began a period of hardening Iranian positions, culminating in the 2009 crackdown on anti-election protests. Ahmadinejad’s election might have been the eventual result of Iranian elites’ fear that a democratic Iraq would have influence on Iranians. Part of the reason Iran interfered so much with the Western nation-building effort in Iraq was to derail attempts at creating a successful democracy. But to blame the effort entirely on Iranian support for insurgencies would ignore Iraq’s long history of authoritarianism and latent sectarianism. Today, Tehran has immense pull on Baghdad. Going back to a time when Iraqi religious activists found shelter in Iran from the assassination orders of Saddam Hussein, Iran has cultivated relationships with Iraqi community leaders. Those leaders have found new fortune since the fall of Saddam. 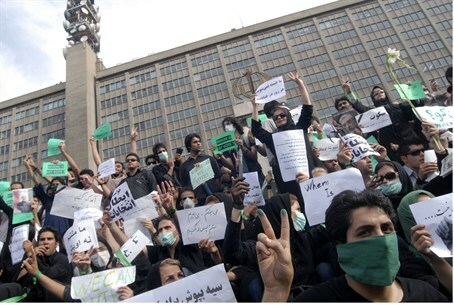 Despite Iran's best efforts, there is still an ideological challenge to the Islamic Revolution. Asked if there was an undercurrent of opposition to waliyat’i faqih in Iran’s clerical culture today, our expert said there certainly are people who would like to see change, but how pervasive that perspective might be is not quantifiable. While not a cleric, Soroush is a renowned religious philosopher who has advocated that for a change to the Islamic Republic fundamental structure that does not necessarily mean eliminating religion from the public sphere – i.e. political secularism. In his mind, it is still a matter that should be put to a public vote.